Business Description: In this business customers can eat at the fast food without having weight problems or possible diseases. In its offer a healthy fast food can enter any food that has a small number of calories, such as juices, fruit, salads and various teas. Instead of fat sauces like mayonnaise or ketchup, natural sauces recipes can be used, that provide the body the nutrients they need, not only a full belly. To attract a large number of customers on the fast food promises can be displayed that if you eat only fast food products offered by your restaurant, one will be healthier and will slim down, and products will be as delicious as the regular fast food ones. Sandwiches can be cooked using healthy bread / flour tortillas, and sandwiches will be filled with vegetables and meat cooked on the grill. 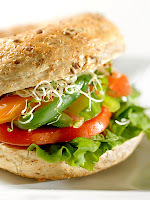 In this healthy fast food various juices can also be served. They can be prepared from various classic fruit or special recipes goji, aloe vera, etc. If using these ingredients, the clients’ health is assured. Conclusion: It would be an interesting and successful culinary business, in which, besides offering better taste, people also get health beneifts. With a little work and dedication this business can become a successful international franchise. 0 Response to "Business Ideas: Healthy fast food"